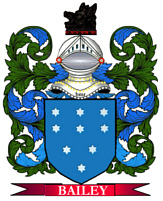 Coat of Arms: Black with three leopards faces within fleur de lis. Crest: A man in armour holding a gold baton. Motto: S'ils te mordent, mords les. Motto Translated: If they bite thee, bite them. Fleur-de-lis: To resemble the flower of the iris or the common lily. 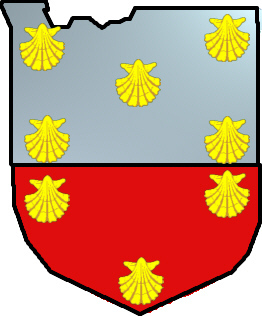 Coat of Arms: Silver and red with eight seashells counterchanged. Motto Translated: Clemency concealed under rigour.